It happened in the blink of an eye. Estimated to be the size of a living room recliner. Then the rock hit the ice and exploded - less than 30 feet away. 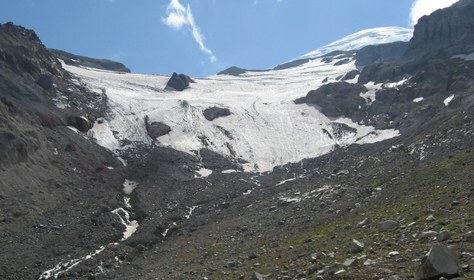 Our party approached the Inter Glacier around 1:30pm and evaluated options for ascending from the boulder fields at its terminus onto the slopes above. We had been advised by the Park Service that rock fall had been observed recently. As we roped together for glacier travel, we observed rock fall along the right edge of the main boot track. Our party did not feel confident about travel on the steep ice at the top of the main track, and had observed rock fall adjacent to it, so we elected to ascend a snow ramp left of the main boot track. Photographs I took of our chosen line show that the snow slope did not have rock fall evidence on it at the time we made our decision. We were traveling in 3 rope teams. Halfway up the snow slope the leader of the first rope heard and then spotted a boulder rocketing down from far above us. She began yelling "ROCK! ", although at that moment she was the only one in position to see the hazard. In response to her warning, I scanned the slopes above but did not see anything. My view of the slopes above was blocked by a rib of moraine that was above us. After about 3 cries of "ROCK! ", I saw the hazard. At that instant, it was airborne hurtling across the moraine slope above me and heading directly at my rope team, and the 3rd rope team, who were below me. By some instinct I moved as fast as possible toward the moraine, which was fortunate for it took me out of the path of the hazard. The hazard impacted the moraine slope above us giving us all the impression that it had exploded, for it sent up an enormous shower of mud, small rocks, and pebbles. The climber above me said that in the fraction of a second he had to react he determined that the streaking missile would not hit him. He only took a couple of steps toward the moraine and was indeed missed by about 6 feet. The 3rd rope team (4 people) beneath us was in the process of traversing the snow slope so that the rope leader and second were not in the immediate path of the boulder. The 3rd and 4th climber on that rope were in the direct line of fire. The 4th climber looked up, gauged where the hazard was, and took cover behind a nearby moraine protrusion. The 3rd climber did not look up, and just went into self-arrest in the snow. It was “not his turn” as they say, for the boulder missed him by about 2 feet. Our team spoke about the event many times during the remainder of the trip. It all happened in the blink of an eye. Estimates of the size of the boulder varied. I estimated it to be about as big as a living room recliner chair. The speed of the boulder is hard to guess. I estimate it was going somewhere around 40 mph. I cannot convey the sickening fear that gripped me as I first glimpsed this hazard flying through the air straight at me, or the helplessness I felt as it exploded on impact with the muddy moraine 30 or so feet from me. Amazingly nobody was hit by anything other than pebbles. I spoke with each party member later on, asking them what they saw and what they did. The rope leader whose alertness spotted the hazard and whose shouted warnings gave us all time to look up may well have saved lives. Second on her rope, was the climber shouted for his team to “Hug the wall!” which was good. The 4th on the rope took cover behind the moraine. And the basic student (3rd on the rope) observed a small moat between the snow he was on and the moraine wall representing his cover. He reported he did not take cover for fear of the little moat. This level of inexperience may be present in many of our basic students. The middle climber on my 3-person rope reported one of those strange slow motion internal dialogues that can occur in a crisis. He said “I could tell that it would miss me. Then I said to myself, why am I still standing here?” and then took a few steps to one side, as it passed him at 40 mph 6 feet to his right. On the 3rd rope team (with 4 people), one basic student did not look up and just went into self-arrest. It would have been far better for him to look up and head for whatever cover was at hand. He was incredibly lucky that the streaking mass missed him. And the last climber, at the tail end of the 3rd rope, reported looking up, judging the line of the hazard, and moving into good cover available to him. I think I will be a long time pulling lessons from this event. For the purposes of a Mountaineers safety report, I recommend reinforcing the need to look up when someone yells "ROCK!" and taking action to protect yourself. Experienced climbers may debate whether our choice of route increased our risk. Keep in mind we had no visual evidence that our chosen snow slope was vulnerable to rock fall. It had none of the obvious rock fall debris on it that the main boot track had.